Base tops are perfect to enhance the bases of your Malifaux miniatures. They are thin inserts etched with a themed design. 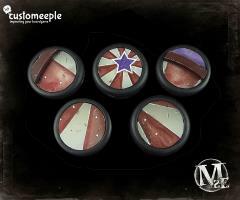 Designed to be glued onto a regular Malifaux base, fit perfectly, and provide the perfect decoration for your best miniatures. The base tops are fabricated in Hard density cardboard. A durable material that is only 0,32 mm thick, ensuring that they will hardly increase the base height. Any miniatures displayed in the pictures are to show the scale of the piece and is not included with the product.